The Little App Activity Table protects your smart tablet from bumps and scrapes whilst still making it easy for your little one to use! Download the app from iTunes or the Play Store and interact directly with the 8 different games using the 11 big and fun manipulative features on the table! The table can also be used without a tablet in place, featuring lots of fun phrases, sounds, songs and melodies. 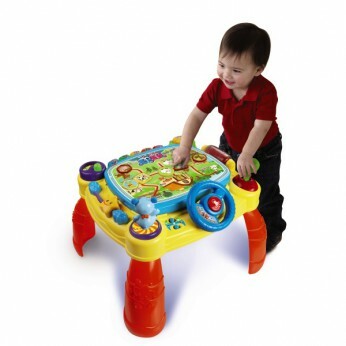 A cute activity table that is compatible with iPad and most Android tablets. Features lots of interactive buttons and other mechanical parts that teach colours, shapes, numbers, music, cognitive development and more. Batteries required: 3 x AA (included); For ages 12 months and over. EAN: 3417761465035 WARNING(S): Only for domestic use. This toy costs approximately £44.99 (for the latest and best prices make sure you check our retailer list for the Little App Activity Table above). In our review of Little App Activity Table we classed it as being suitable for ages 1 to 3 years but recommend you check the manufacturer specific advice before purchasing.